1:6 scale bouquet of 5/8″ and 1/2″ “creamy dusk” and “light magenta” Mulberry paper roses with oblong 3/4″ leaves attached by hand, arranged with pieces of plastic Queen Anne’s Lace as scale baby’s breath. Vase is a 15ml fluted shot glass, courtesy of OneSixthSense on etsy. Vase filler is 1:1 scale non-toxic polymer water pearls (dry, straight from package) from craft store. I’ve been where you are. I’ve been stood in the silk flowers aisle of my local Jo-ann Fabric & Crafts, bemoaning the fact that even the tiniest silk gypsophila baby’s breath is still too large to work as 1:6 scale flowers. I have raised my fist to the sky and wept hot, wet tears that despite six full aisles of silk flowers arrange by colour there are so few options for miniature floral arrangements that work at 12″ fashion doll scale. Well, mourn no more, fellow diorama artists! For I am here to tell you about the wonderful world of mulberry paper flowers, and how you’ll never have a complete meltdown at Michael’s again, cursing your lack of a fully-functioning shrink ray. There are advantages to mulberry paper flowers and leaves over silk/plastic artificial flowers. For one, due to the texture of the painted paper flowers, they photograph better. 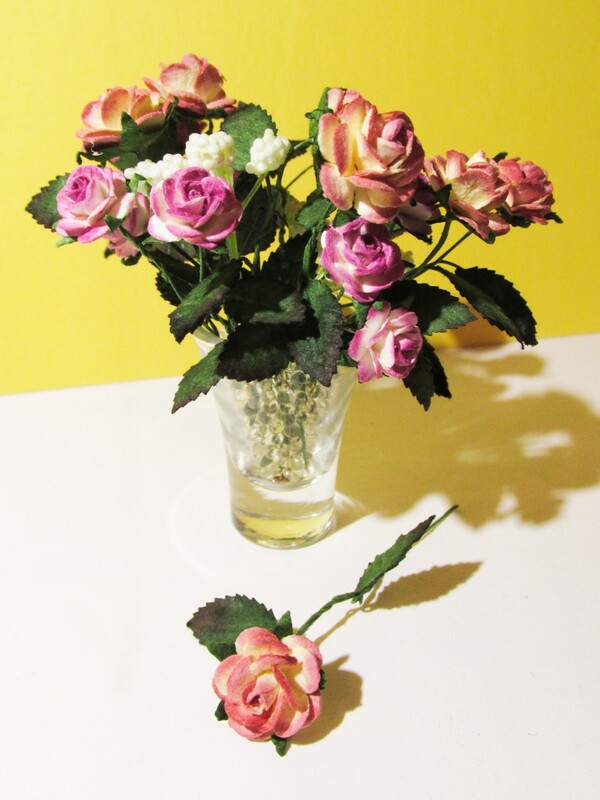 The way light reflects and is absorbed by the paper more closely mimics real-life flower petals, and the thin green wire stems can be bent easily, adding a touch of realism to your dioramas. For another, they are very inexpensive. 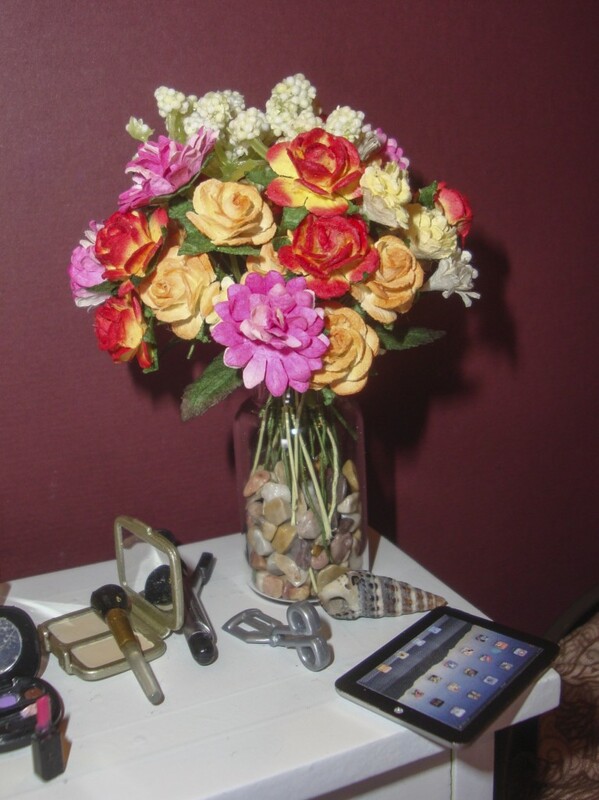 For example, a bundle of 50 paper roses–available in multiple sizes from 10mm (⅜”) to 25mm (1″)–can cost as little as $5.00 USD. A wide variety of blooms can be found–from tea roses, closed rosebuds, gypsophila, daffodils, mums, and gardenias to name a few, allowing you to create bouquets and centrepieces with variety of both colours and types of flowers. Leaves in different shapes and sizes can also be purchased, and wound around the thin wire stems easily, for an even more realistic touch. You’ll be able to find mulberry paper flower heads easily in the Scrapbooking Embellishments section of your local craft store, but for 3 dimensional open and closed roses and other flowers, you are going to have to resort to online sellers. Bulk orders can be made from craft suppliers such as Wild Orchid Crafts, Schokdiijung on etsy, or ebay sellers like MulberryCraftsUS.